With a stay at Paradisus by Meliá Cancun - All Inclusive in Cancun (Zona Hotelera), you'll be a 4-minute walk from Aquaworld and within a 5-minute drive of Cancun Interactive Aquarium. This 4.5-star property is 2.4 mi (3.9 km) from El Rey Ruins and 3.7 mi (6 km) from La Isla Shopping Mall. Make yourself at home in one of the 657 air-conditioned rooms featuring LCD televisions. Conveniences include phones, as well as safes and separate sitting areas. Dip into one of the 4 outdoor swimming pools or enjoy other recreational amenities, which include a health club. Additional features at this property include complimentary wireless Internet access, concierge services, and babysitting/childcare (surcharge). Enjoy international cuisine at Naos, one of the property's 10 restaurants, or stay in and take advantage of the 24-hour room service. Snacks are also available at the coffee shop/café. Relax with a refreshing drink at the beach bar, the poolside bar, or one of 7 bars/lounges. A complimentary buffet breakfast is served daily from 6:30 AM to 11:00 AM. Featured amenities include a business center, express check-out, and dry cleaning/laundry services. Event facilities at this property consist of a conference center and a meeting room. Free self parking is available onsite. 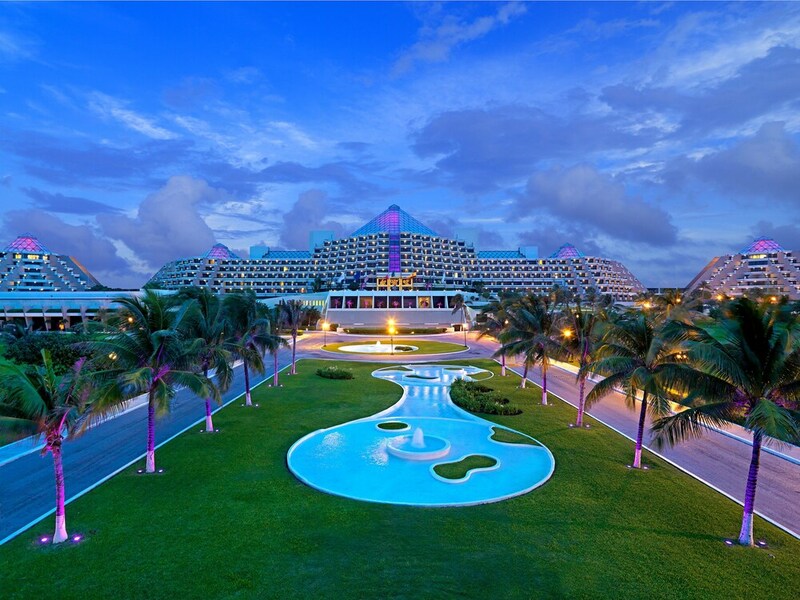 Paradisus by Meliá Cancun - All Inclusive is an all-inclusive property. Room rates include meals and beverages at onsite restaurants and bars. Other items and amenities, including taxes and gratuities, and access to recreational activities and entertainment may also be included. Additional charges may apply for meals at some restaurants, special dinners and dishes, certain beverages, and other amenities. Paradisus by Meliá Cancun - All Inclusive features 4 outdoor swimming pools, a health club, and a children's pool. Dining is available at one of the property's 10 restaurants and guests can grab coffee at the coffee shop/café. The property also has a snack bar/deli. Guests can unwind with a drink at one of the property's bars, which include 7 bars/lounges, a beach bar, and a swim-up bar. Guests can enjoy a complimentary breakfast each morning. A computer station is located on site and wireless Internet access is complimentary. This 4.5-star property offers access to a business center and a meeting room. This all-inclusive property also offers a terrace, a complimentary children's club, and tour/ticket assistance. Limited complimentary onsite parking is available on a first-come, first-served basis. Paradisus by Meliá Cancun - All Inclusive is a smoke-free property. A complimentary buffet breakfast is served each morning between 6:30 AM and 11:00 AM. Naos - Overlooking the pool and garden, this restaurant specializes in international cuisine and serves breakfast, lunch, and dinner. A children's menu is available. Open daily. Market Grill - This poolside steakhouse specializes in Brazilian cuisine and serves dinner only. Guests can enjoy alfresco dining (weather permitting). Reservations are required. Open daily. Mole - Overlooking the ocean and pool, this fine-dining restaurant specializes in Mexican cuisine and serves dinner only. Reservations are required. Open daily. Vento - Overlooking the garden, this restaurant specializes in Mediterranean cuisine and serves dinner only. Guests can enjoy alfresco dining (weather permitting). Reservations are required. Open daily. Bana - Overlooking the garden, this sushi bar specializes in Japanese cuisine and serves dinner only. Guests can order drinks at the bar and enjoy alfresco dining (weather permitting). Reservations are required. Open daily. 4 outdoor swimming pools are on site along with a children's pool. Other recreational amenities include a health club. Reservations are required for golf tee times and massage services. Reservations can be made by contacting the property prior to arrival, using the contact information on the booking confirmation. Only registered guests are allowed in the guestrooms. Some facilities may have restricted access. Guests can contact the property for details using the contact information on the booking confirmation. No pets and no service animals are allowed at this property. Book a stay in any room category (except Royal Service rooms) from now-April 30, 2019, for travel July 6-August 15, and 1 child age 12 and younger stays and eats free when staying in the same room as parents and using existing bedding. Full details provided at check-in. Free stay reflected in rate displayed at time of booking. Valid for all room categories except "Royal" rooms. Maximum 1 child per room. Offer subject to availability. Offer can be combined with other promotional offers. Other restrictions may apply. Book a stay in a rate plan displaying the “Limited Time Offer: USD 30 Spa Credit” green tag for travel now-December 21, 2019 and receive a USD 30 spa credit for use on select spa treatments (per room, per stay). Spa voucher and redemption details provided at check-in. Spa appointment may be required. Guest must provide voucher at time of service. Taxes and gratuity may not be included. No refunds for any unused portion of offer. Offer subject to availability. Offer is not valid with groups/conventions and may not be combined with other promotional offers. Other restrictions and blackout dates may apply.